S.B. Goldschmidt, Frankfurt; sale, Friedrich Schwarz, Vienna, 11 March 1907, lot 11 as style of Adriaen Brouwer. 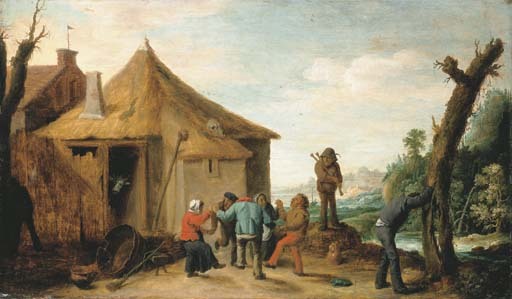 This work is of considerable interest as a very early work by David Teniers II. Dr. Margret Klinge, in a letter dated 21 August 1995, dates it to 1632-1633, during which period Teniers was received as a master in the Antwerp guild of St. Luke. The earliest dated painting by David Teniers II is of 1633 (see M. Klinge, catalogue of the exhibition, David Teniers the Younger, Antwerp, Koninklijk Museum voor Schone Kunsten, 11 May-1 September 1991, nos. 1 and 3-5). In Dr. Klinge's view the present work was executed by Teniers when still in his father's studio; indeed the landscape background could be the work of his father, David Teniers I.